It's a relief when a neighborhood favorite manages to remain in the neighborhood despite an increase in rent. In this case, Nyonya shuffled across the street into slightly fancier digs while still maintaining the same reliable food. 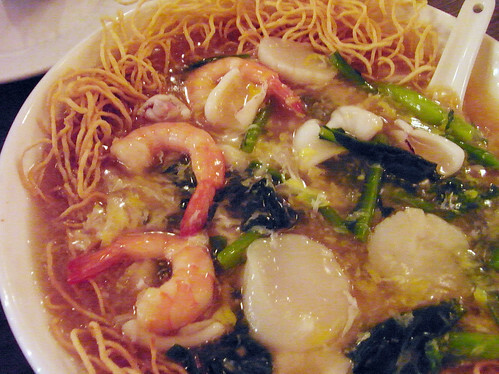 We ventured outside of the usual array of noodle and rice dishes to try the seafood crispy noodles. The waitress warned us about the gravy sauce but she should have maybe made it a little more clear that the seafood crispy noodles would be swimming in sauce, not just lightly coated.